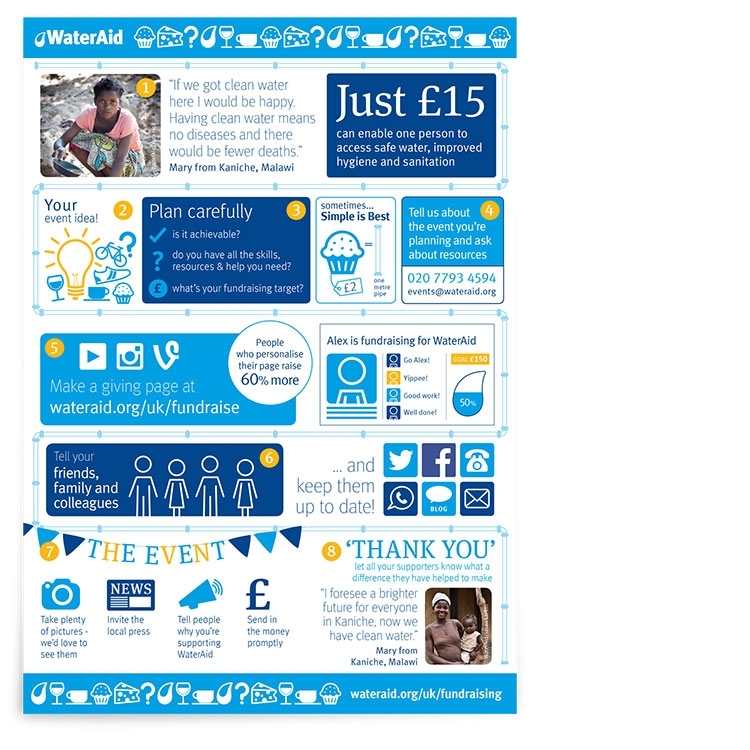 Continuing our long relationship with WaterAid, Progression Design were approached to design a series of event marketing materials for the upcoming World Toilet Day. 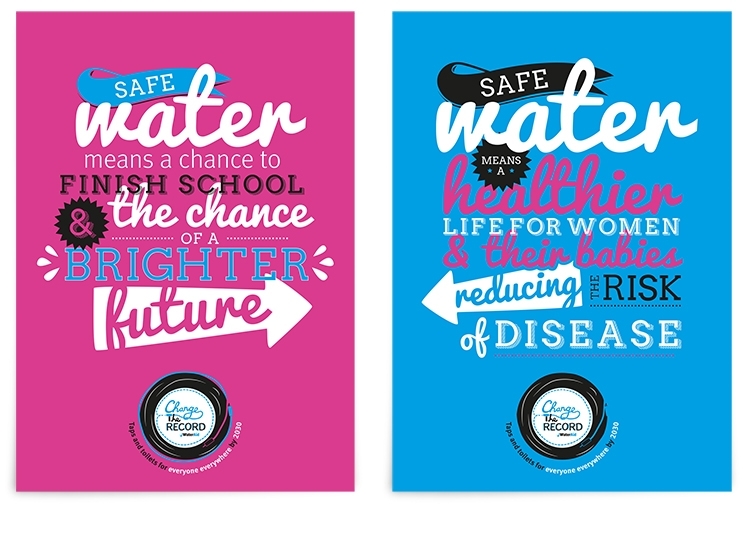 Firstly Progression Design created an event logo based around the ‘it’s no joke’ campaign title. 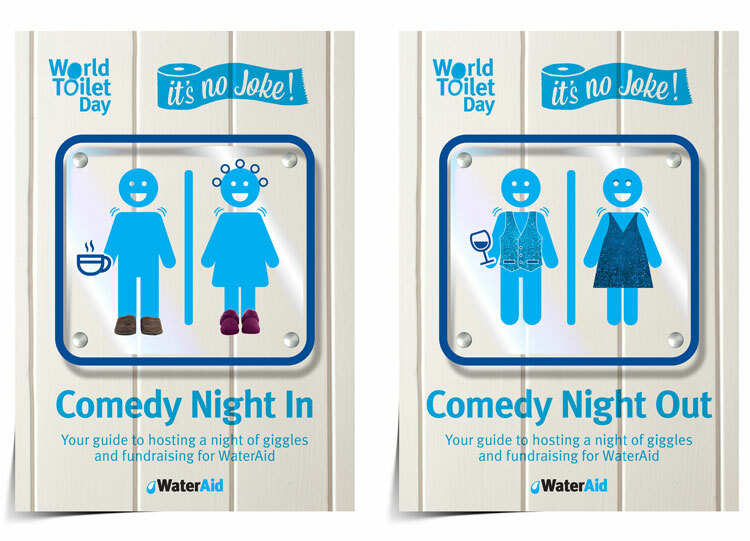 Supporters were encouraged to either go along to, or run comedy nights in or out. 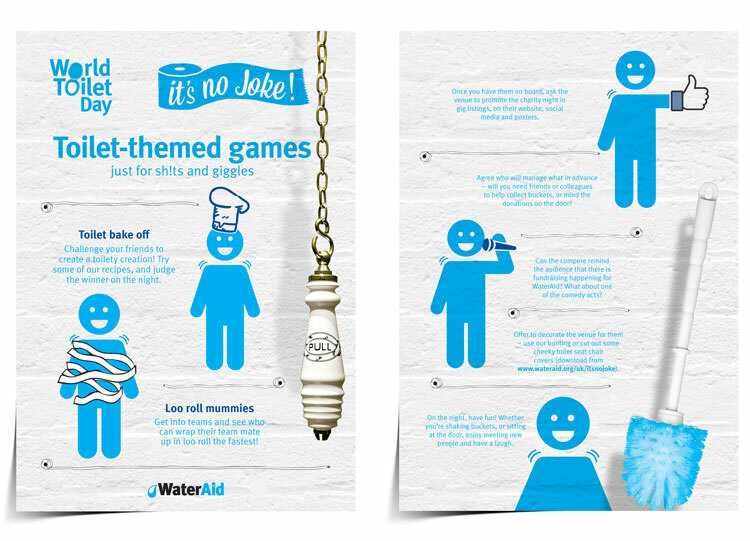 We introduced the fun element of toilet icons, dressed them up (this gave us flexibility to highlight key messages) and set them against the backdrop of toilet doors and walls with some large toilet imagery to supplement them. The resulting materials had real standout and ensured the campaign hit all it’s targets. As in previous years, Progression worked with WaterAid to create and produce all of their campaign materials for the festival. 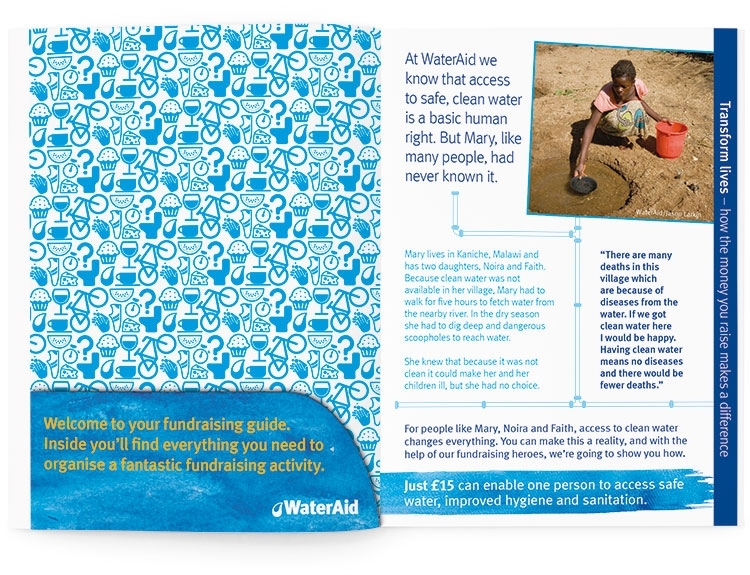 Among all of the materials produced (including badges, hand stamps, stickers, banners and tattoos), we designed and printed the volunteers hand book and onsite posters. 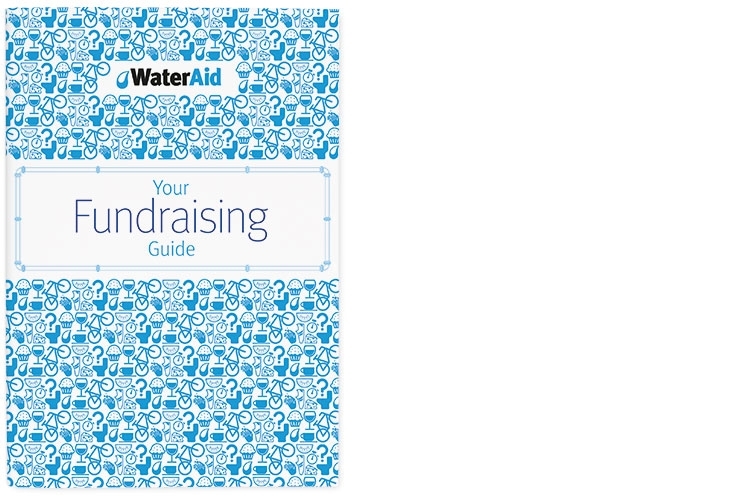 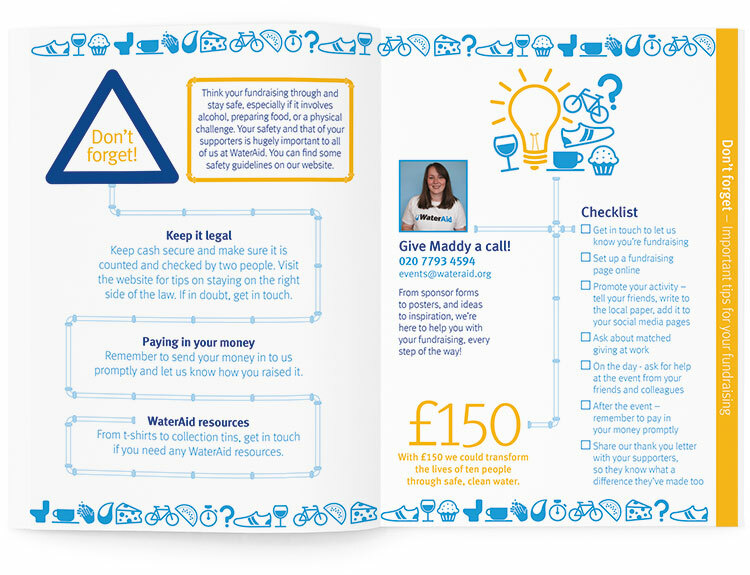 We recently created a fun and engaging fundraising pack for WaterAid. The pack consists of an A5 folder which contains ideas and inspiration to people who are organising their own fundraising events. 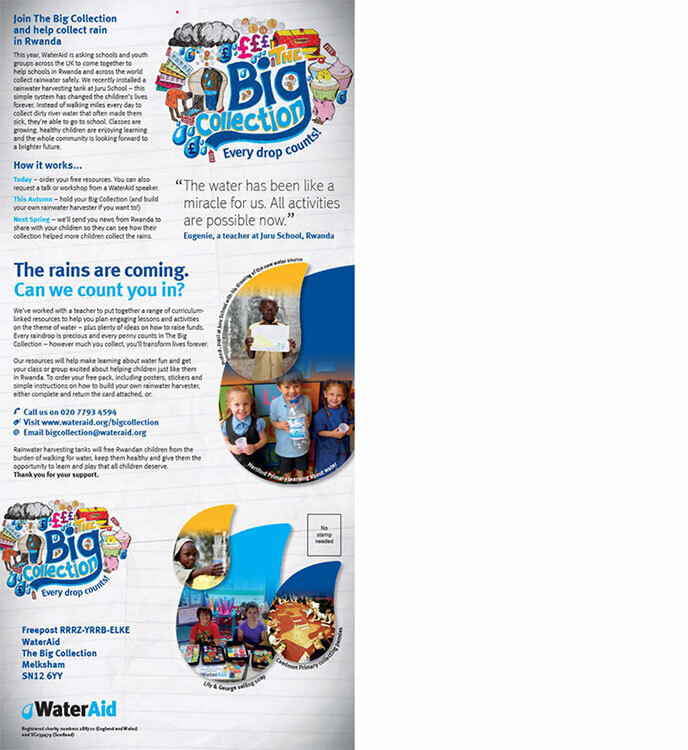 Other elements are currently being worked on, including stickers, bunting and various posters and fold-out information sheets. 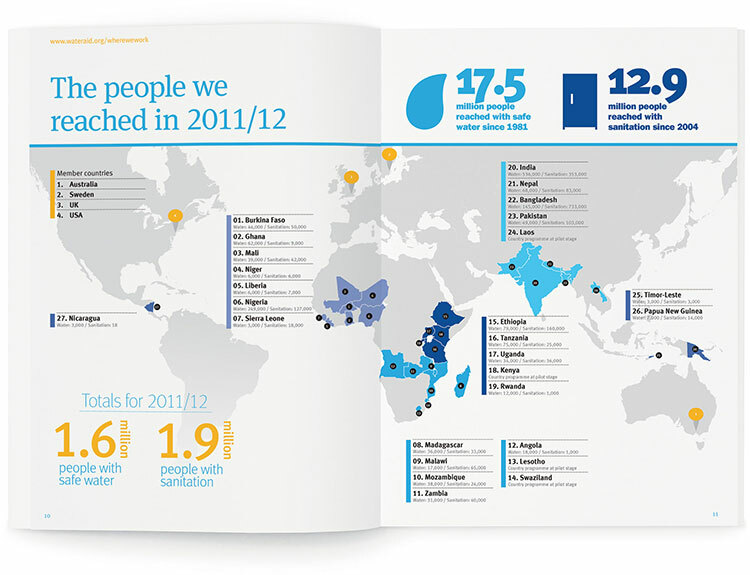 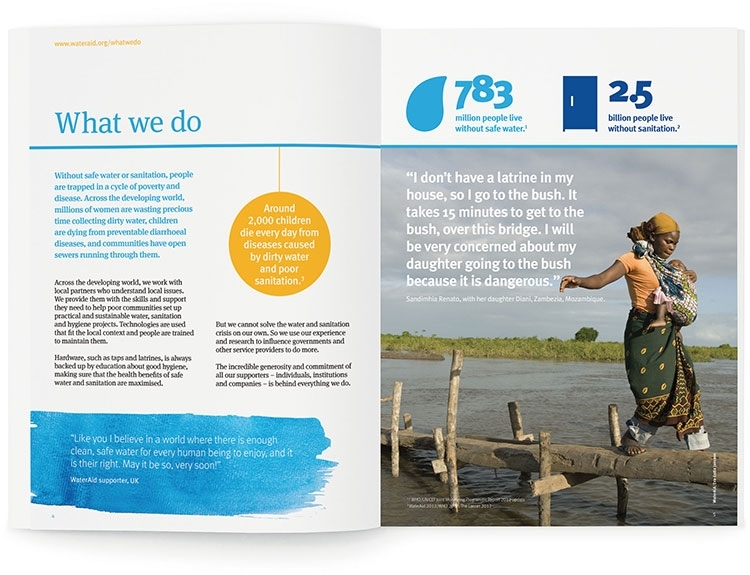 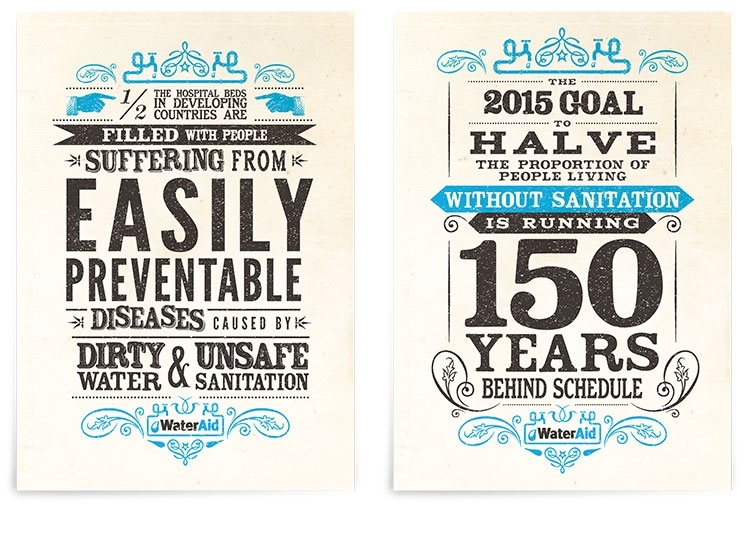 Working with WaterAid, we created a fresh look for their annual review. The design is bright, uncluttered and utilises plenty of space to get the key messages across. 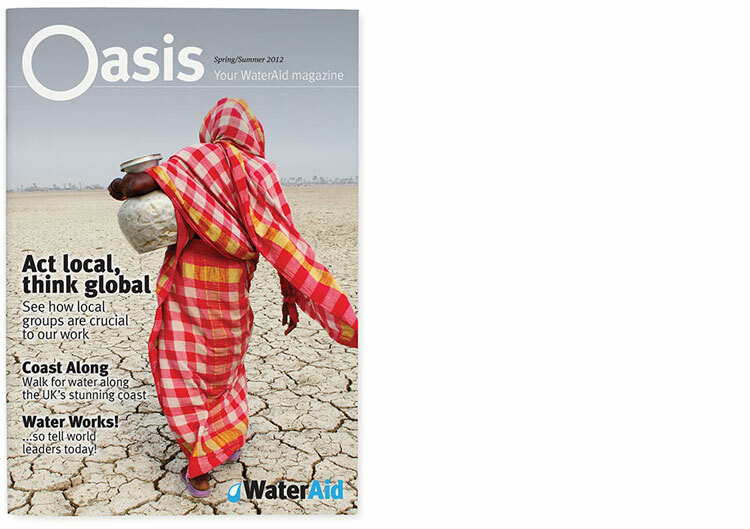 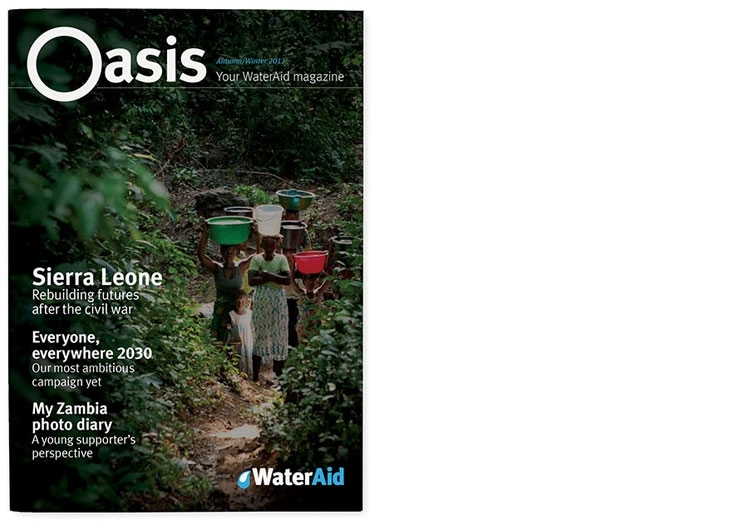 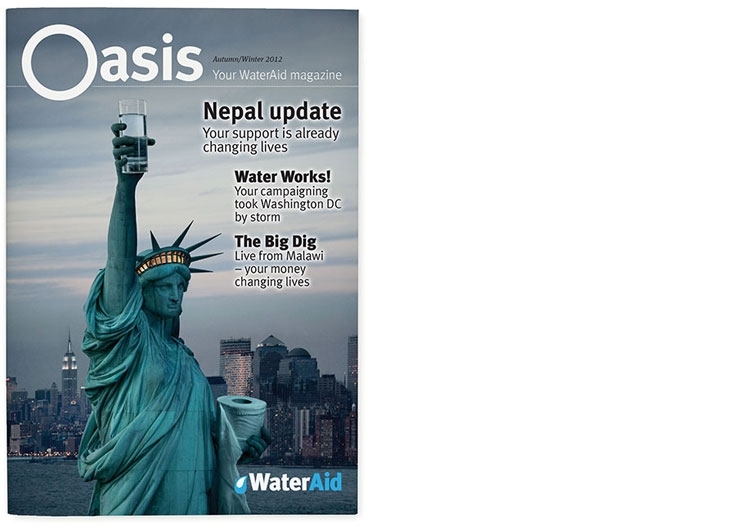 A new project for Progression undertaken last year was to update and refresh the official WaterAid magazine, Oasis. 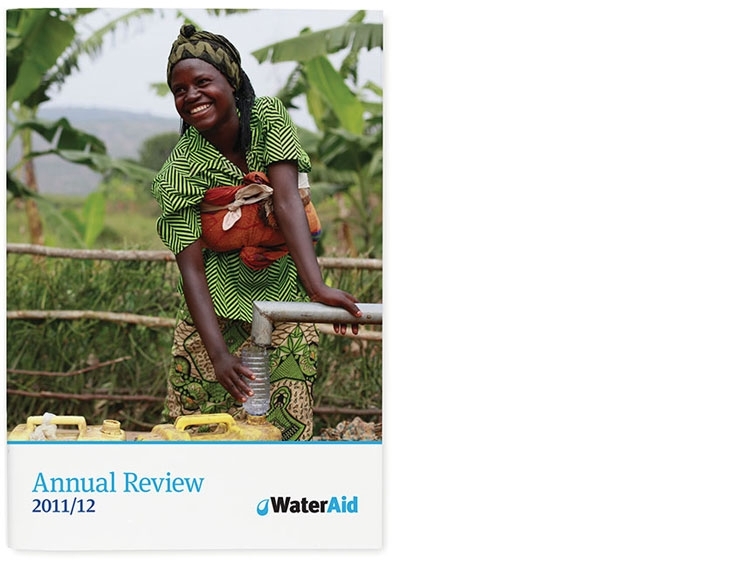 It went from an A4 publication to A5 which proved to be a real design challenge as we needed to showcase the fantastic photography which WaterAid has access to while retaining a decent word count. 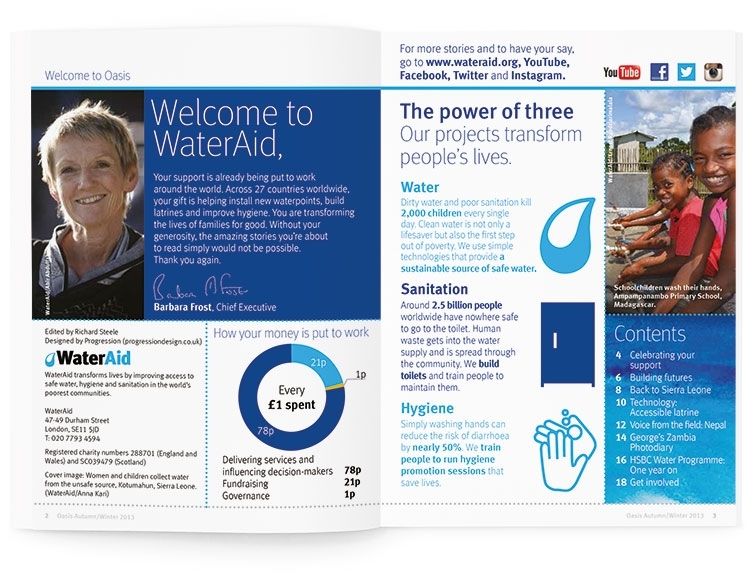 The magazine is freely distributed to over a quarter of a million supporters twice a year. 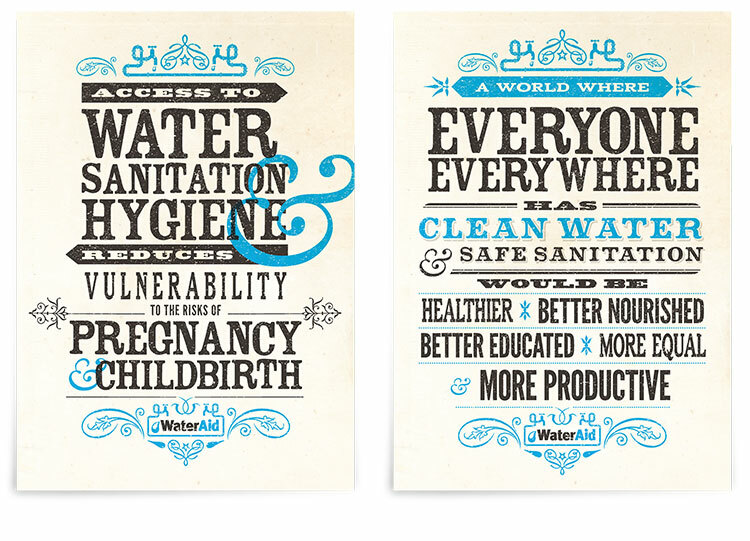 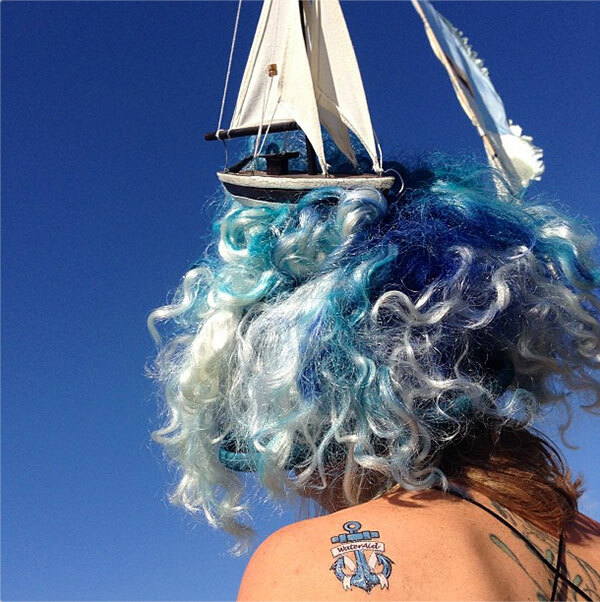 We designed and produced a temporary tattoo for WaterAid to hand out at this years Bestival on the Isle of Wight. The festival’s theme this year was HMS Bestival so we thought that the traditional anchor tattoo would be very appropriate! 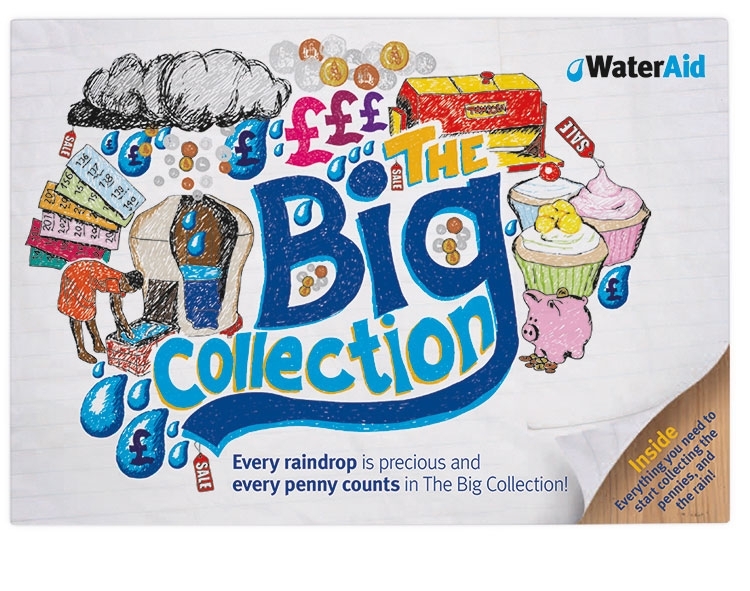 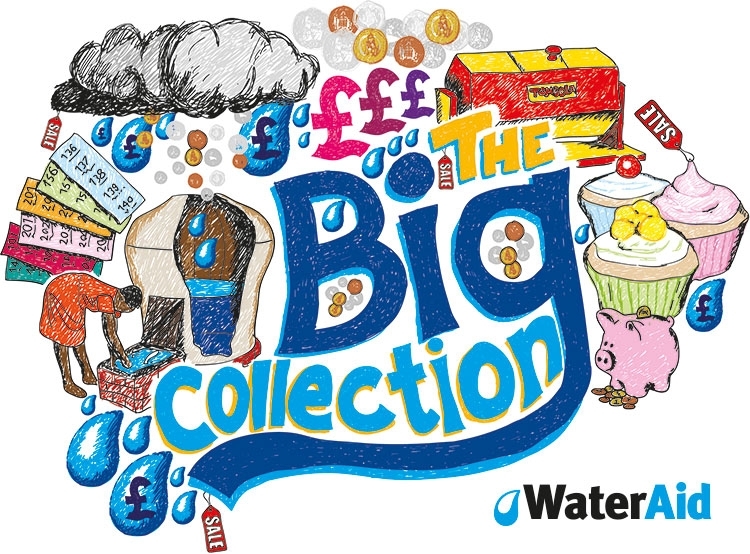 The Big Collection is one of many WaterAid appeals that Progression have created the identity for. 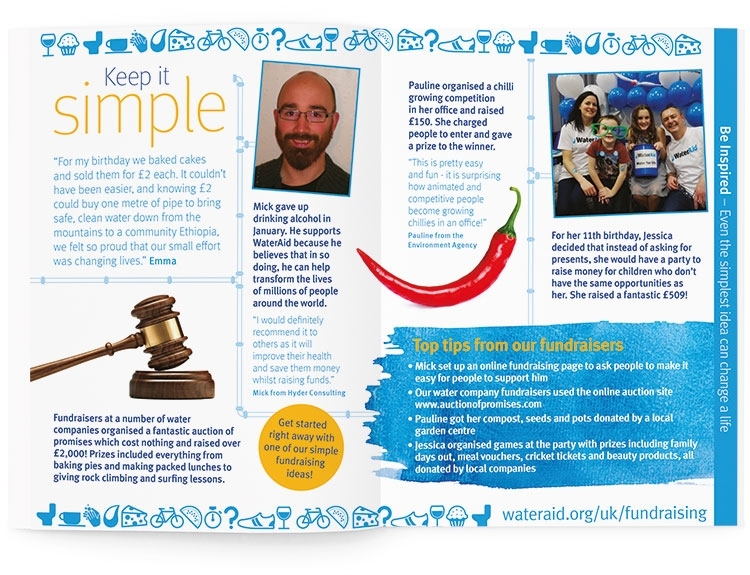 The appeal was aimed at schools and encouraged them to raise funds for WaterAid by organising fun events and activities. 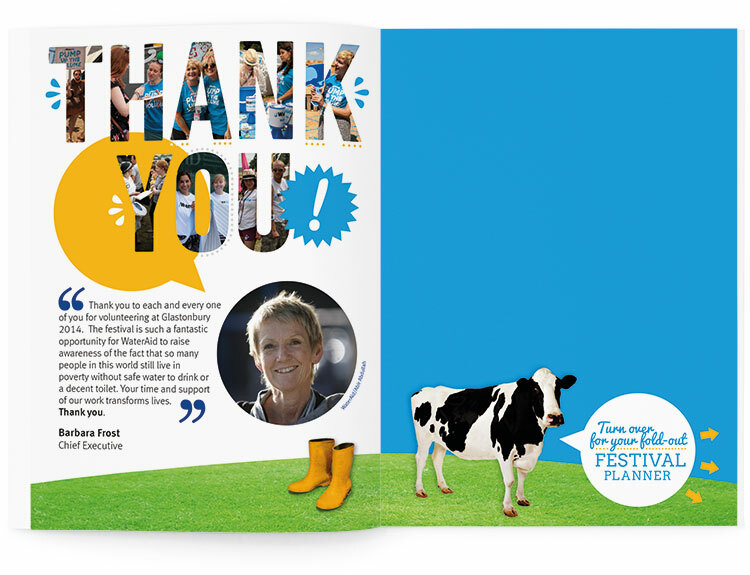 The overall appeal consisted of creating the logo, posters, a fundraising pack, postcards, donation forms, stickers and envelopes. 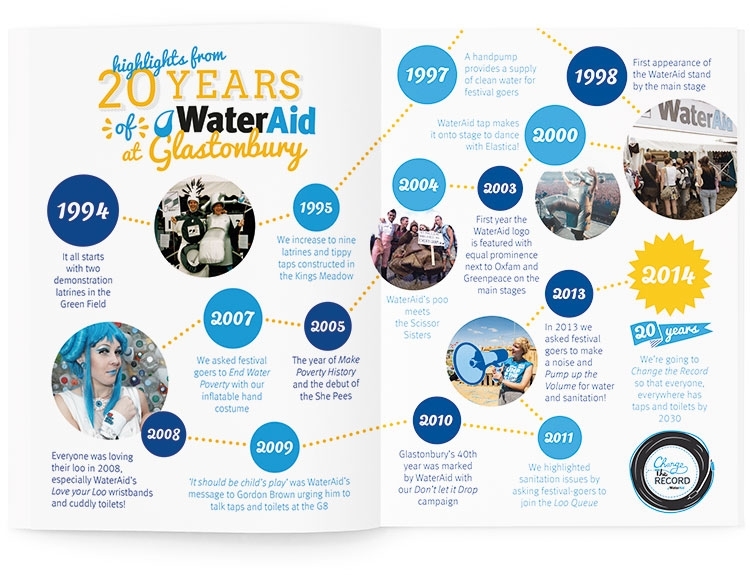 Over the years, Progression have worked with WaterAid to design and produce their on-site materials at Glastonbury. 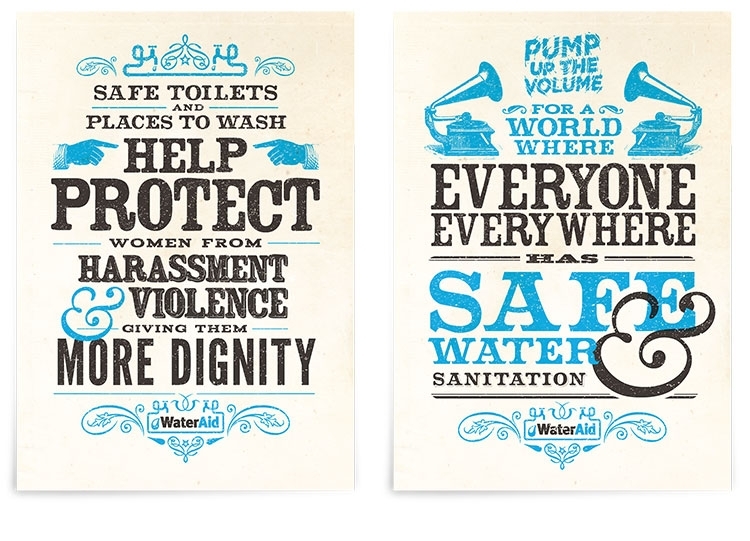 This year we designed a set of six posters – each with a strong message or statistic regarding the water and sanitation crisis, and a tattoo that people wore to show their support for WaterAid’s cause. 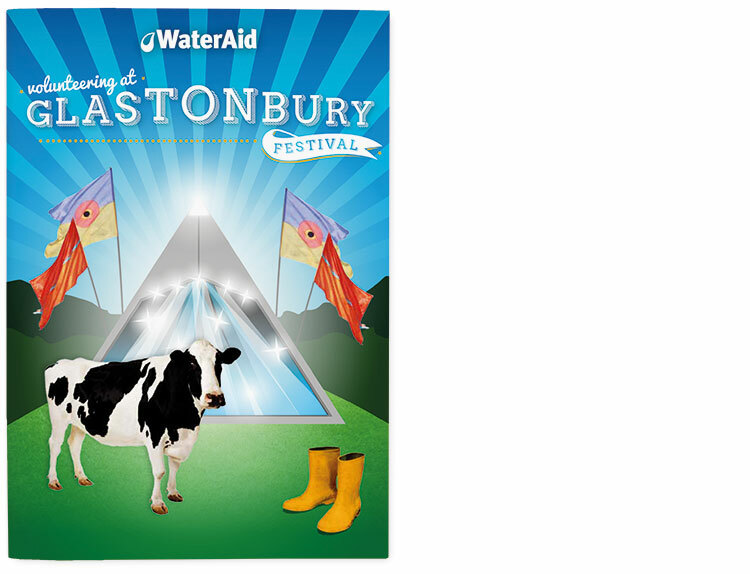 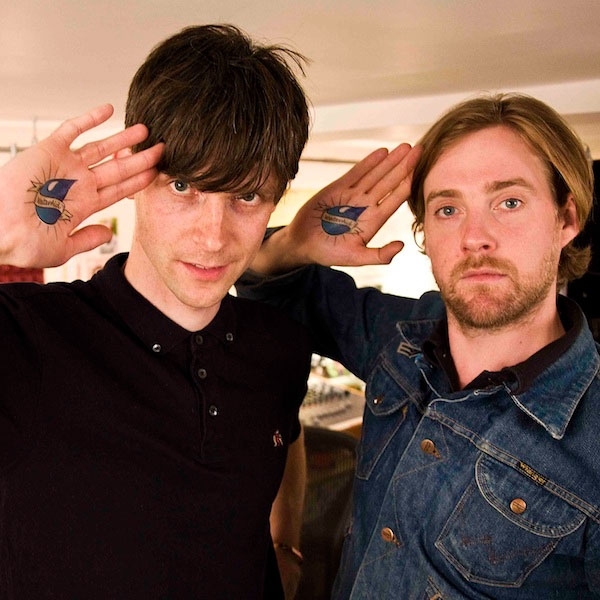 These people also included Faithless, Kaiser Chiefs and Kate Nash. 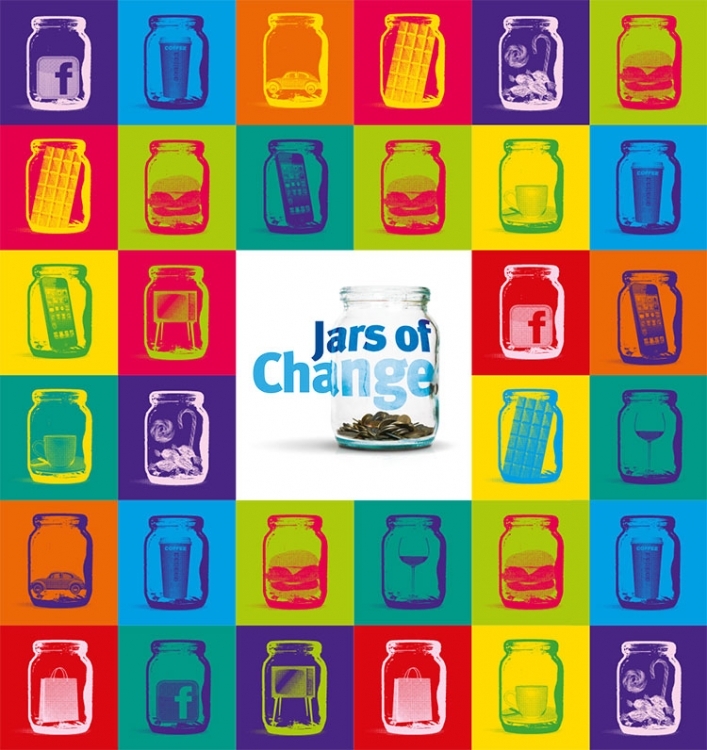 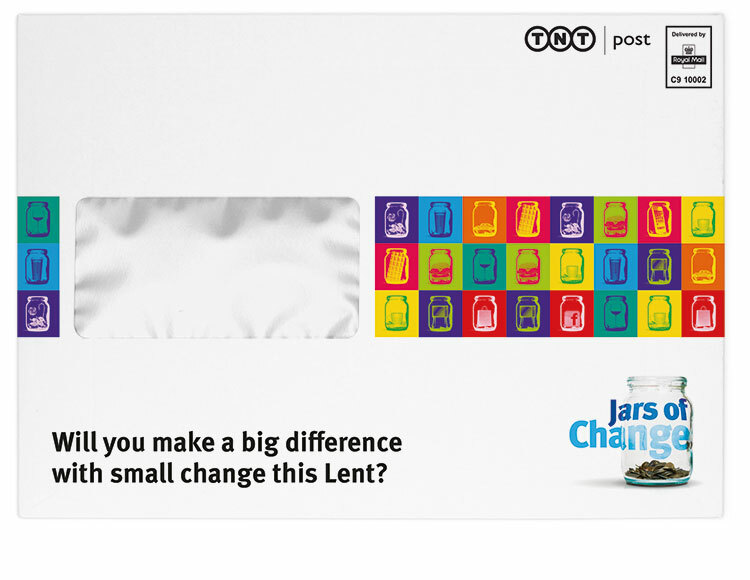 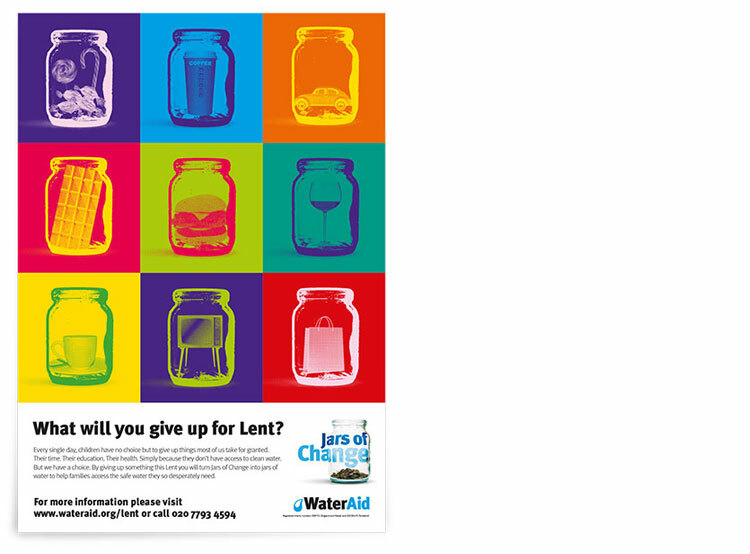 Jars of Change is WaterAid’s Lent appeal. 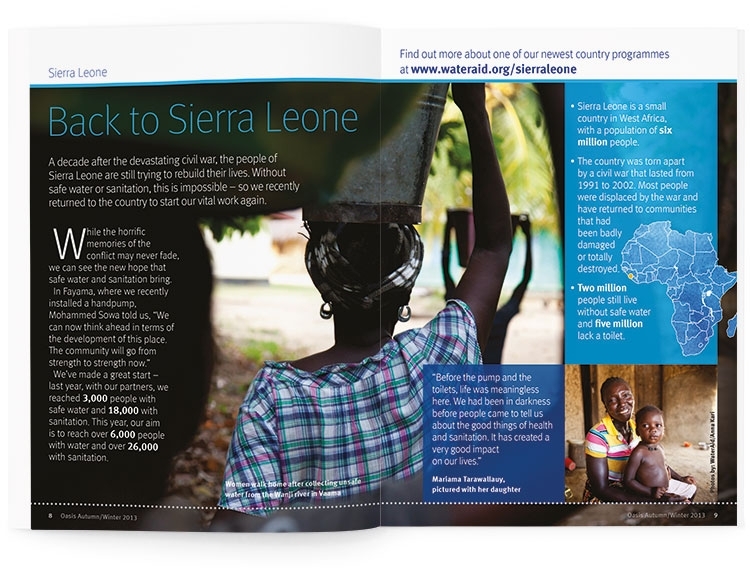 Progression came up with a colourful eye-catching design to achieve maximum impact and to stand out amongst the other appeals circulating at this time of year.